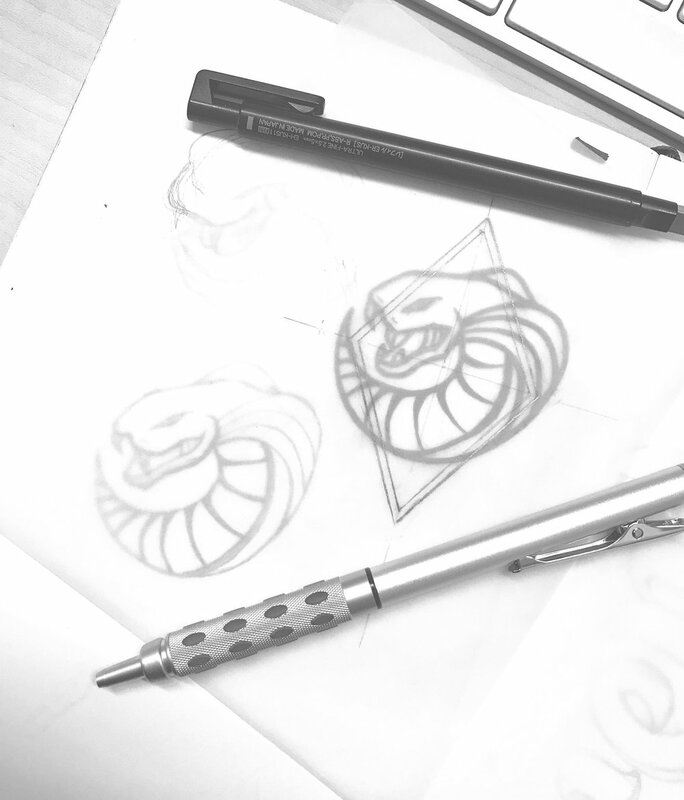 The Nitro Product team was looking for a creative take on a decal that they could put on their wall of the office and asked me to create a logo after their team name, Cobra Command. Inspired by sports logos and bold stroked and play on shadows I created a logo that utilized both Nitro colors and a cobras patterned scales. This panel art is inspired by the Nitro postcard hoodie design. This time it shows a playful illustration of all of our offices in different color combos to give it personality. 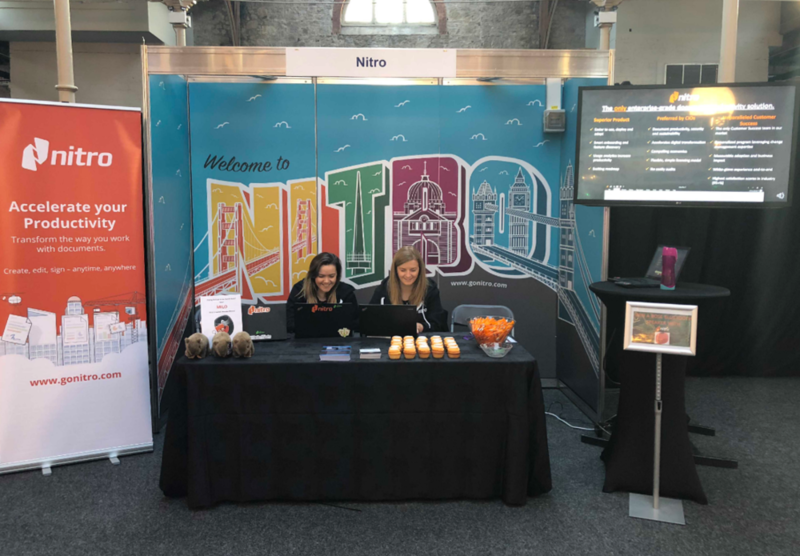 The booth was a success and the panels are reused and hung in the Nitro Dublin office. 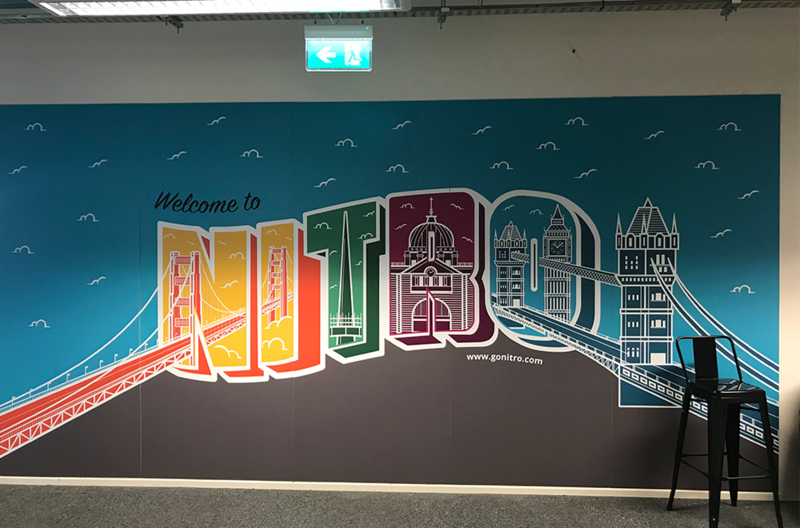 The fun and illustrative designs were implemented in our major offices around the world like San Francisco (HQ), Dublin, and Melbourne to increase awareness of which category our daily snack pantry trash goes into. A playful take was used to convey the items along with a color coordinated header to help employees remember where trash items go. The following were fun illustrations depicting the old way to sign documents versus the new way, which is the Nitro way. An isometric design style is used her to show depth and small city is portrayed in each level of plane. A darker and more grey color palette is used to give a plain and sad environment below, while the Nitro way above shows multiple workflows and a thriving city with life and color. 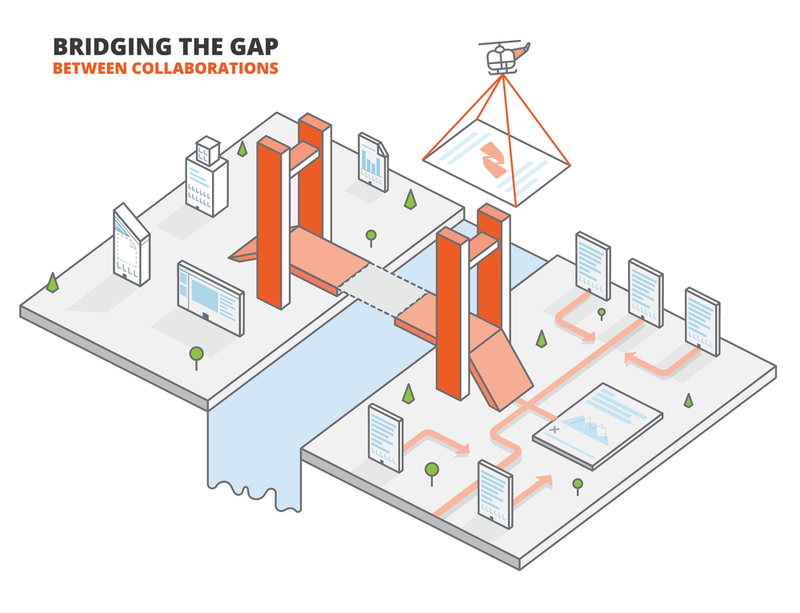 This concept uses the idea of Nitro’s solution a way to bridge the gap between people who collaborate between documents. On one side a city with no workflow of documents, while the other side shows productivity and efficiency. In between, a Nitro helicopter comes to bridge the two cities and make them one productive one. This was fun page to create for pages that were still in progress for our developers. I was inspired by “Prison breaks” and the hunt to find a page that out and about. This design was one design that the office was planning to put up on one of lobby walls. The signage displays Nitro’s Values which are illustrated below. I hand lettered everything and vectored it to clean up the line work. Each value has its own type style to show hierarchy and contrast between values.